4th Annual Local Ramadan Packages! 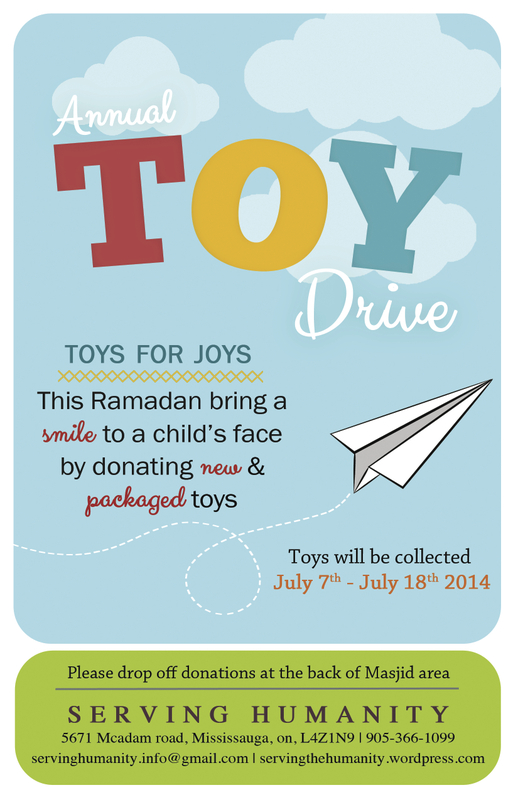 Every year Serving Humanity holds a Ramadan food package drive for local families in the GTA. These packages are delivered to families in need before Ramadan. The items included in these packages are of daily use such as oil, rice, flour, tea bags and much more. Last year we collected 143 packages which were delivered to our local shelters and food banks. Our aim this year is to exceed that number and provide our neighbors with food for the month of Ramadan. Please place all food items on the table at the back of the cafeteria. Our team reported this story from one of our previous Ramadan drives. Let’s raise the bar once again and put our share to help our neighbors this Ramadan. 3rd Annual Local Ramadan Food Packages! Our Annual Toy Drive Project is About to Begin!